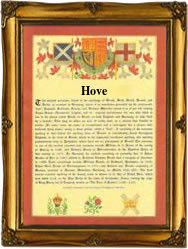 Recorded as Have, Hoave, Hove, Hoves and Hovenden, this is an English medieval surname. It is locational either from the famous Sussex coastal town of Hove near Brighton, or from Hove Edge, a diminished village near Brighouse, in West Yorkshire, or possibly as a short form of Hovenden, a now totally "lost" village, which was probably in the same area of Yorkshire. The meaning of the place names are the same. This is "hood" from the Olde English pre 7th century word "hufe", but used with the transferred meaning of a shelter. Curiously Hove in Sussex does not seem to provide much in the way of shelter being on an exposed shoreline, but perhaps it did many centuries ago. Hove Edge is quite a bleak spot, whilst Hovenden was probably Hufe-denu in ancient times, and this means sheltered valley. The surname is quite rare, although as Have and Hove has been recored in the surviving registers of the city of London since at least Elizabethan times. These recordings include Richard Hove who married Alice Hills at the church of St Helens Bishopgate, on August 2nd 1582, and John Have, a christening witness at St Botolphs Bishopgate, on January 14th 1616. Perhaps surprisingly the first recording of all is that of Alan de Hovenden of Yorkshire in the Hundred Rolls of landowners in the year 1273. This was the first year of the reign of the famous King Edward 1st of England, and known to history as "The hammer of the Scots."